With the Elegance Inc. Success Path being your own boss is easy and lucrative. With Elegance Inc. you make your own hours and YOU decide when you deserve a promotion. The Elegance Inc. Success Path is your road map to success. welcome to the road to success! Elegance Inc. believes it has come up with the best start up incentive program in the entire industry. 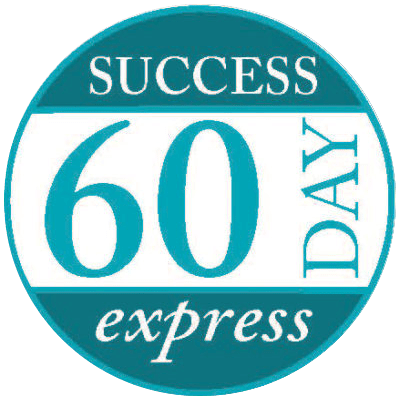 Success Express truly puts you on the road to success. In your first 30 days whatever you earn in commission (25% – 30%) will be matched in free jewelry (you pay the sales tax and shipping) so your boutique will be filled with fabulous items. The more you can show to your customers the more you can sell and the bigger and faster your business will grow. Now that you have discovered Elegance Inc., the next step could be to bring a friend or two with you on the adventure of being an entrepreneur and start your team. For every friend that joins your team in your first 100 days who sells $1,000, you will receive $250 in store credit. Receive $100 in FREE store credit for every $1,000 in retail sales you make to add to your already fabulous display. 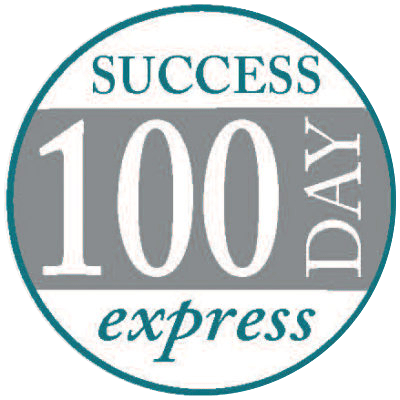 Sign up a new Boutique Owner and receive $250 in store credit for the first $1,000 in retail sales they sell during your time in Success Express. Plan ahead to make the most out of your Success Express. Since Elegance Inc. is going to match your commission check in your first 30 days with FREE jewelry to help you create a beautiful display (you pay sales tax and shipping), plan to do as many Socials as possible in your first 30 days. 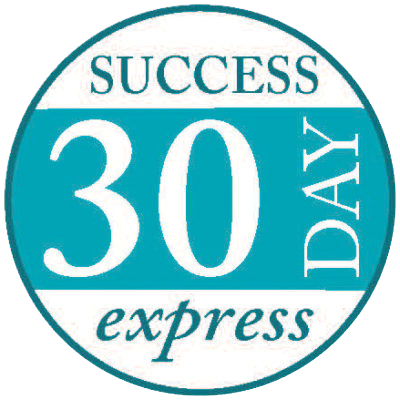 There is no limit to how much FREE jewelry you can receive in in your first 30 days Success Express. Also if you want to layer your income and build your Society, now is the time to start. Every friend that is signed directly under you in your Society that sells $1,000 or more during your first 100 days, you will receive $250 in jewelry credit. This jewelry is yours, to wear, to display, to sell. Every entrepreneur and business owner knows that the best product is FREE product. The more effort you put in your first 30 days, the more momentum and profit your business will have!!!! Be Empowered Through Elegance Inc.
Elegance Inc, has a very generous Success Path. We want you to be able to set your goals and dreams and achieve them with us. Building a Society is the best way to achieve financial freedom. The charts that you will see gives you the Royalty rate you will earn for your Society depending on the Paid as Title you achieve that month. When you sign a friend up to do this business, you will receive a percentage of everything she sells if you meet the minimum requirements of $500 per month in sales yourself. 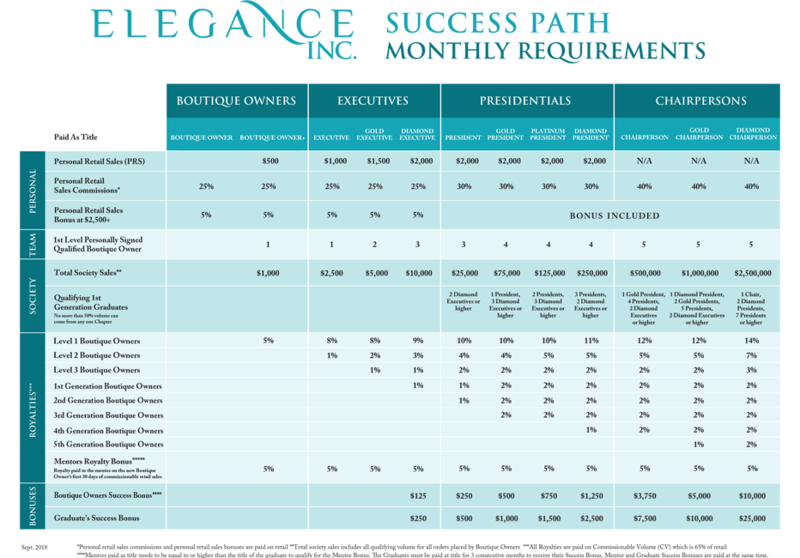 With Elegance Inc. you decide when to give yourself a promotion and add more team members to your Society. With every new promotion you receive a new title, and your pay increases, just as in the corporate world. The only difference between Elegance Inc. and the corporate world is that you are your own boss, you decide your own hours, you set your own personal goals for success, and your Mentor will be by your side every step of the way. Everyone can win. There is no corporate ladder where you will climb over others. With Elegance Inc., the more you win, the more your Mentor wins. The more your Society wins, the more you win, etc. It’s a circle of winning. The higher you go in the Success Path, the more money you make! With Elegance Inc., you own your life, own your success and most importantly you OWN YOURSELF. With Elegance Inc. you decide when to give yourself a promotion and add more team members to your Society. With every new promotion you receive a new title, just as in the corporate world. The only difference between Elegance Inc and the corporate world is that you are your own boss, you decide your own hours, you set your own personal goals for success, and your Mentor will be by your side every step of the way. The higher you go in the Success Path, the more money you make!